CD Projekt have snuck two screenshots onto Twitter of the second and final Witcher 3 expansion, Blood and Wine. This one takes place in Toussaint, a Nilfgaardian duchy big on wine and tradition. As its name and favourite tipple suggest, Toussaint takes after southern France, all bright colours, terracotta roofs and sunshine. Maybe it'll be the thing to relieve that haunting misery I've felt since stepping into Velen. Not much is known about Blood and Wine other than a vague release window of the start of next year and even vaguer allusions to an 'ancient and bloody secret'. 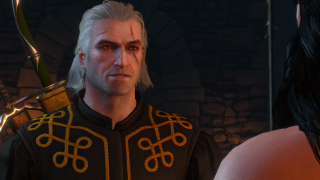 The Witcher 3's first expansion, Hearts of Stone, proved to be another solid chunk of witchering, if not a revelation. At another 20 hours, Blood and Wine ought to keep us hunting monsters and being moody well into 2016.